This is my first Pico-8 game. It follows both on growing and 2 keys themes. 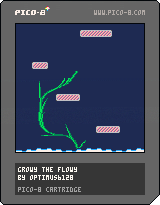 You are growy the flowy, a growing plant that tries to reach the skies and avoid all danger above and below. Left and Right to control plant direction. p.s. The source is inserted in the PNG cartidge link, then you have to use Pico-8 framework to load the cartidge and edit the code. Or maybe I'll try to upload the P8 somewhere. That's a really nice game. Love the graphics and adherence to the themes. A score (plant height) would have been a good addition. That's a lot of fun! The graphics are simple yet very good. Having a score as well as moving obstacles would be good. Adictive and beauty, i love it! I have to admit, that's a novel mechanic if I've ever seen one. Good job! I just loved this game. Missing a highscore to give it some replay perspective. I love the art style and the way that the plant is handled. Beautiful job! Nice flowing art. I really like the fire effect upon impact! very neat! Certainly not the only "growing vine" entry into this compo, but definitely one of the more polished ones. The pixel art and color pallet is clean and pretty, and the burning effect when you fail is very well done. Overall, an excellent submission! Nice job, good idea and interesting mechanic. Nice to play. There doesn't seem to be much of an objective however. poor growy :( you were inconveniently long but we still loved you even more than you can imagine! Very solid. The visuals are a reward in themselves. Very pretty game. It's probably not doable with Pico-8 but it'd be kind of neat if you could export the final version of Growy you made. Sometimes I just 'wandered' around making circles for fun. Very nice growing algorithm, and graphics are fitting. I like the how the vine handles too. I can tell you're an artist so I'm going to go hard on you, the boxes are awful! Hideous texture. However the plant is orgasmic, although if it had a bud at the end I would get less long :P But good job overall. I like that plant visual. Keep up the great work ! I love the graphics and the visuals of the game. Very nice growing animation and effects, very style!!!! Loved this! I love the look of the vine as it grows. Very well done, very addicting. I wish I could just zoom out and draw pictures with this effect. The stem generation and look is very nice! Quite engaging and visually pleasing! It could use more challenge though. Nice work! I love that you made this with pico, and it's really well done too! Amazing graphics! however a scoring system would be nice. i really liked how smoothly the plant generated, while still being pixelated! I really like the visual of the planet growing. This could be a really relaxing and fun game with the proper music and polish. Very fun!Growth mechanic is fantastic! Good Job! Should have a good soundtrack to play and relax! wow, really great job, especially for your first pico-8 game, it looked nice, sounds were fitting, and the death animation was really cool. the control was nice and tight, and I could easily spin the plant around, avoiding obstacles, and forming some really pretty formations. Nice art and controll of the growing, but no fun Gameplay. Pretty damn well put-together. A fun little game. Nice graphics - good to see generated art and not only tiles from Pico-8 carts. Would have loved a little bit music as well. This is quite relaxing to play! I love the way vines spread out from the main branch. It's a pleasurable experience. Nice game. My favorite part is the vine growing animation. Looks really nice. I think the game could be greatly improved by one simple addition: a score. I can't see how far I've come. I can't compare my runs and I can't progress or compete so there is very little reason to play more often. Surprisingly fun and nice to look at. Loved the animations and death sequence. Lovely game, thanks for making it! Nice and simple! I was just getting the hang of it and saying it was too easy when I lost horribly, so that's moot. A "high score" and music is all you need to publish this! Very nice entry! A general goal (score or ending for example) would have make it better though... But them leaves look güüüüd!! At the day of the release I wanted to upload and go to sleep. I had an FTP which is still down. Later the next days I thought to upload to bitbucket, which I forgot. I did it now, updated the source button. Great game! I liked the difficulty curve.